Plantain herb is one of our most versatile medicinal plants. It heals many types of wounds, takes the swelling and sting out of a variety of insect bites, and can even be used for dry coughs and mucus membrane inflammation. Despite its many attributes, the plantain weed is a humble and persistent plant. It doesn’t boast vibrantly colored flowers. Its leaves often hug the ground, or grow tall to blend in with the surrounding grass. It can thrive in hard packed soils with lots of foot traffic and it loves disturbed areas. Best of all, if you know how to spot it, you can most likely find this herbaceous perennial whenever you need it. There are about 200 species worldwide, with about 30 native and 5 introduced species in the US. You could simply memorize many of the benefits of plantain; however, you would be missing out on understanding its special affinities. You will have a deeper understanding of its abilities when you view it through the lens of its energetic properties. Plantain herb is energetically cooling and it excels when used to counteract hot conditions. What is a hot condition? Hot conditions are characterized by signs of heat, including feeling hot, redness (or sometimes yellow), sharp pain, swelling, and inflammation. Burns are an obvious example of a hot condition as the burned area feels hot and turns red. A red, hot, itchy rash would be another example. A fresh plantain poultice can soothe burns and rashes by both pulling out the heat and healing the damaged tissue. Another example of a hot condition is bites and stings from insects, spiders, and scorpions. Let’s take a bee sting for example. When a bee stings a person it releases its venom into the skin. Fairly quickly, the area around the sting will swell, turn red, and feel hot to the touch. The pain is generally sharp (as opposed to a dull ache). 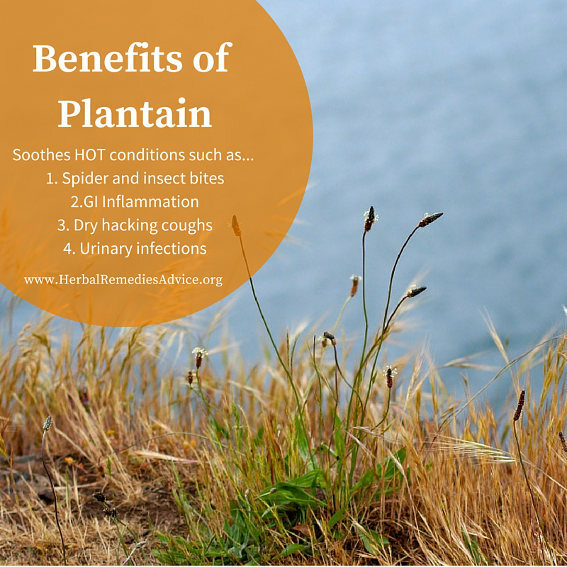 Plantain herb is perfect for this “hot” condition. A fresh poultice of the leaves has the ability to pull the poisons from the skin and dramatically decrease the redness, swelling, and pain. I’ve seen this work again and again on many different types of bites and stings. For best results apply the plantain as quickly as possible after the sting and change the poultice every 20 minutes or when it feels warm to the touch. A plantain salve will also work well, especially on common itchy insect bites, like those from flies and mosquitoes. Plantain herb stitches together many types of wounds, from minor cuts and scrapes to blisters to hemorrhoids and postpartum tears. It makes a wonderful all-purpose salve, poultice, or sitz bath (combined with other herbs such as Calendula). 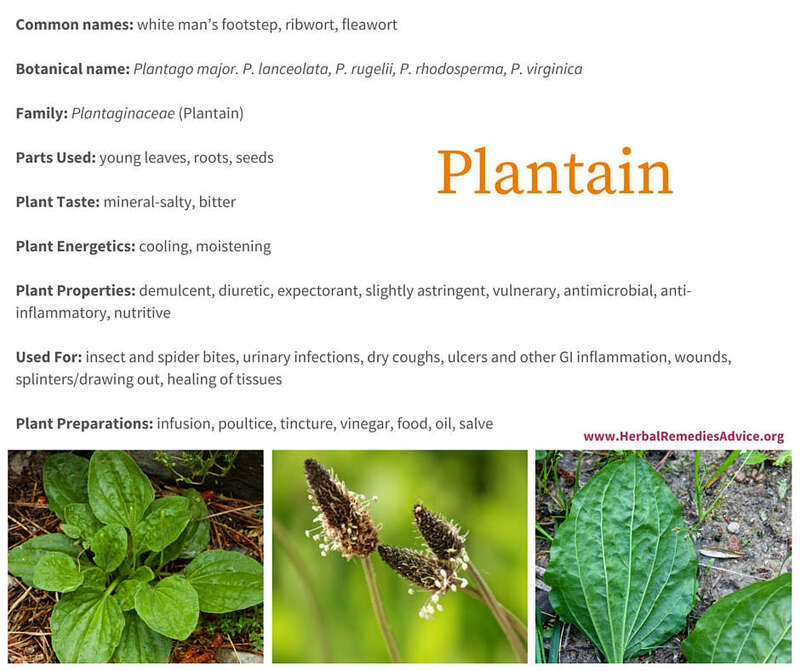 Because it has the ability to draw things out, plantain is perfect for splinters, boils, or even puncture wounds. Plantain is also antimicrobial, so it helps to prevent bacterial growth in wounds as they heal. Infections are also hot conditions where plantain excels. Examples include infected wounds (poultice or soak is best), boils, eye infections, or urinary tract infections. I like to combine Echinacea with plantain when specifically dealing with infections. 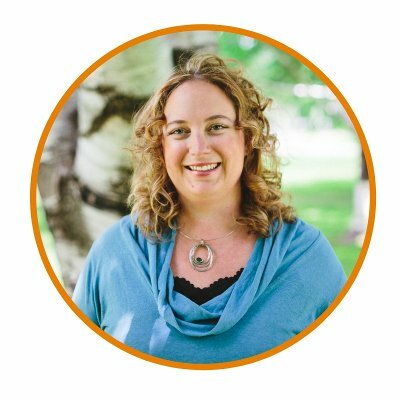 My first plant teacher, Karen Sherwood, has successfully used plantain poultices on blood poisoning while she was out hiking in the back country and didn’t have access to medical care. Plantain herb can also be taken internally to modulate an excessive histamine response to stings or from seasonal allergies. I learned from Matt Wood (or was it Kiva Rose, or maybe jim mcdonald?) that fresh plantain tincture combines well with peach leaf/twig tincture for calming overly reactive tissues that create symptoms such as runny nose, itchy and runny eyes, sneezing, or dramatic responses to bug bites. Herbalist jim mcdonald recommends using slightly saline plantain leaf tea in a neti pot for nasal irritations or as a wash for eye infections (see below for instructions). Plantain is an obvious choice for many first aid or acute inflammations, but it is equally useful for chronic hot conditions, especially in the digestive tract. A strong plantain leaf infusion (tea) can be one of the most dramatic healers for inflammatory digestive problems, including intestinal permeability (leaky gut), ulcers, and inflammatory bowel diseases. In this situation, plantain soothes the inflamed tissues, helps to heal the tissues (vulnerary), prevents bacterial overgrowth (antimicrobial), and can seemingly knit those tissues back together (astringent). It can also be a powerful healer for the upper digestive tract. It can relieve the pain of canker sores and speed up the healing of the tissues. It’s also a nice tea to include for people who have acid reflux, as it can soothe and heal the tissues of the esophagus. Besides being cooling for hot conditions, plantain is also moistening (demulcent). These two qualities make it ideal for hot and dry lungs, resulting in chronic or acute coughs. My favorite application for this is the dry, hacking cough that hangs on long after your upper respiratory infection has healed. In this situation, anti-tussive herbs may temporarily stop the cough but, by addressing the root cause (heat and dryness leading to irritation), you can more effectively alleviate the cough and change the dry conditions in the lungs. Herbalist jim mcdonald specifically recommends plantain for coughs that result from the inhalation of fine particulate matter, which might be experienced in a work environment or during wildfires or weather conversions. Plantain seeds are mucilaginous and high in fiber. Seeds collected from Plantago ovatum or P. psyllium are harvested on a large scale and sold as “psyllium” seed and husk, which are used to maintain bowel regularity. Psyllium is where the product Metamucil® gets its name. The seeds from Plantago major, P. rugelii, and P. lanceolata can be used similarly, but the process of harvesting enough of those tiny seeds is time consuming. Plantain seeds also are deliciously edible and can be eaten raw or added to cooked foods, or whole plantain seed stalks can be steamed and eaten if the seeds are too tedious to collect. When using plantain for bites and stings, fresh leaves are preferred. A simple spit poultice is often the best choice. To make a spit poultice, chew up a fresh leaf or two until the cell walls are broken and you have a gooey, green leaf poultice. Place this on the affected area. A whole leaf can be used to cover the poultice and a Band-aid® or gauze can further hold the poultice in place. Any hesitation you may feel about how this green mess looks will quickly be forgotten as it soothes the pain and swelling or itching. If you live in an area where plantain disappears from summer heat or under winter snow, you can keep some dried plantain leaf on hand and it can be rehydrated with warm water to make a soothing poultice or fomentation. When infusing plantain into an oil for a salve, wilt the fresh leaves slightly or use a hot water bath method. When making a tincture, fresh plantain leaves are also preferred. The young fresh leaves make a great salad green, cooked green, or pesto addition that is high in nutrients, especially minerals that are often lacking in modern diets. As the leaves mature, the strings in the prominent leaf veins can make the experience more like flossing than eating. You can avoid this by chopping the leaves cross-wise to cut the strings into short pieces. Plantain leaves are wonderful as a strong infusion (tea) for healing digestive wounds, for general GI inflammation, or for dry and irritated coughs. I like to prepare this with one ounce of the leaves (roughly 30 grams) to a quart of just-boiled water. Steep for four hours or overnight. This preparation is also a good way to enjoy the mineral nutritive benefits of plantain. Infuse two heaping tablespoons of dried plantain leaves in 1 1/4 cups of just-boiled water for ten minutes. Strain very well through cheesecloth to remove any small particles. Measure out 1 cup (8 ounces) of the tea. While still hot, add 1/4 teaspoon of fine white (non-iodized) salt and stir to dissolve. Use this in a neti pot or as an eye wash.
Plantain herb is regarded as safe and there are no common allergies or adverse effects associated with its use. Plantago major and P. lanceolata are originally from Eurasia and now grow practically everywhere. They love roadsides, lawns, pathways, and disturbed soils. There are over 200 species within the Plantago genus. There are two types of plantains that are regularly used as medicine. One type is commonly called broadleaf plantain. It has oval or egg shaped leaves. Plantain major (European native) and P. rugelii (US native) are both examples of broadleaf plantain. From a practical point of view, these plantains are interchangeably used. From a botanical point of view, they are separate species. One distinctive property is that the base of the leaf stems of P. major are white, whereas the base of the P. rugelii stems are reddish. 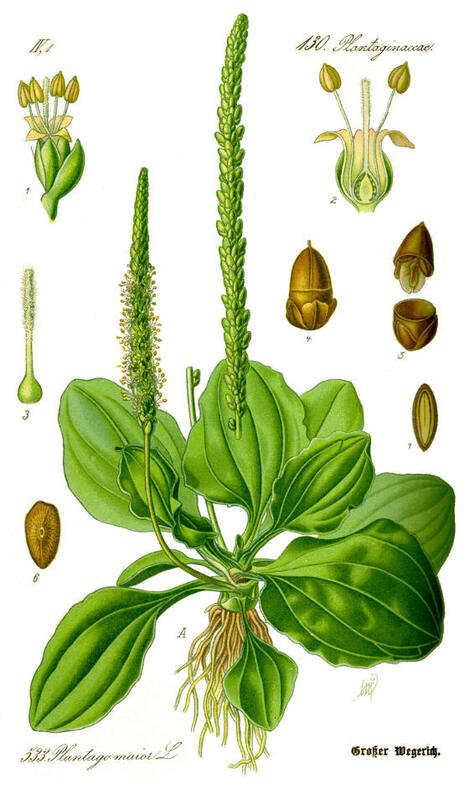 The other type of plantain, Plantago lanceolata, has long narrow leaves and is commonly called narrowleaf plantain. Both the broad-leaved and narrow-leaved plantains have prominent parallel leaf veins. If you gently pull the leaf apart, you will see the strings that run through the leaf veins. Plantain flowers grow in dense spikes that rise above the leaves of the plant. The flowers are wind pollinated and the plant reproduces mostly by seed. I am often asked which plantain is best. As far as I can tell, each of these three species (and many others) can be interchangeably used. To answer even more practically, the best one is the one you find growing at your feet. Plantain herb has a special place in my heart. It was the first herb I learned about when I started my herbal journey and I think it is the epitome of herbalism as the “people’s medicine.” This common weed is a safe herb that is a powerful healer for hot and dry conditions. It is also the epitome of sustainable medicine. 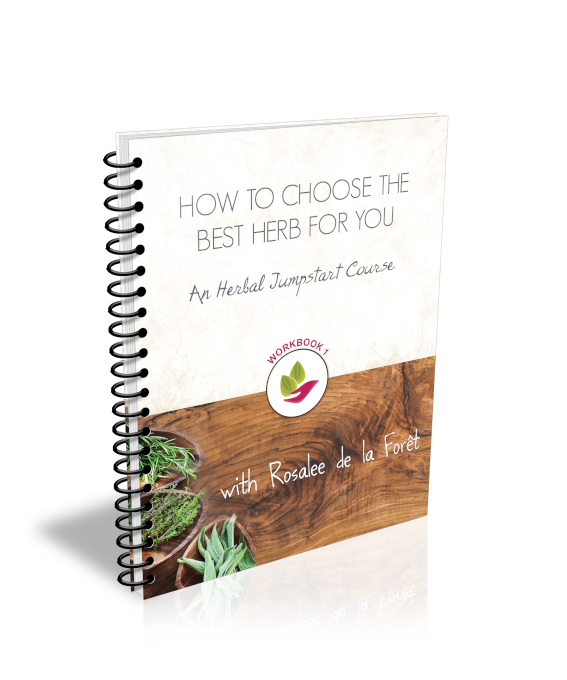 You won’t have to pay lots of money for your own supply or ship this herb from halfway across the world to enjoy its benefits…I’ll bet it’s growing abundantly near you already!